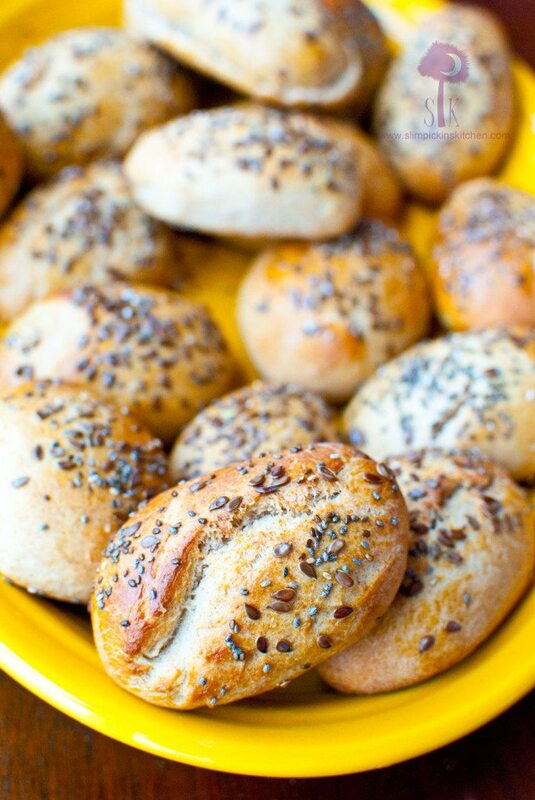 These Whole Wheat Quick Rolls are ready in under 40 minutes are a made-from-scratch, warm and chewy whole wheat dinner or sandwich rolls sprinkled with chia and flax seeds and shaped to fit your needs. And they are totally not the kind you are thinking about even though I’m DY-ING to get a baby in this belly. Yes, ma’am. I mean, I’m not getting any younger here people. This biological clock is a tick-tick-tockin’. Apparently there is something in the water that hasn’t made its way into my system yet because I swear all of my friends, acquaintances, sisters, next door neighbors, celebrity crushes and the Duchess of flipping Cambridge is knocked up and having a baby except for me. Oh, AND every single one of them is due in July. Uuuum, hello?!?!? Where is my magic baby pill? I just don’t have the patience to wait for such things. Why can’t having a baby just happen overnight like a magical cup of chocolate covered strawberry oats? Then why can’t they just stay babies and not morph into evil teenagers who like to drink too much and wreak havoc on their parent’s lives. Why can’t they just stay cute and cuddly like a precious little otter or something? Seriously, why couldn’t we just be Toys R Us kids forever? Is that really too much to ask for? Now I can’t even step foot in the place because the last one I went to was so dingy and gross and unkempt, it seriously looked as if the editors of peopleofwalmart.com just lifted the roof and hurled its refuse into the aisles because those characters were too hideous and repulsive to appear on their website. Wow. Ok, hi! Sorry for that wee bit of a rant. I have not a clue where that came from. You want to know what you don’t need patience for? 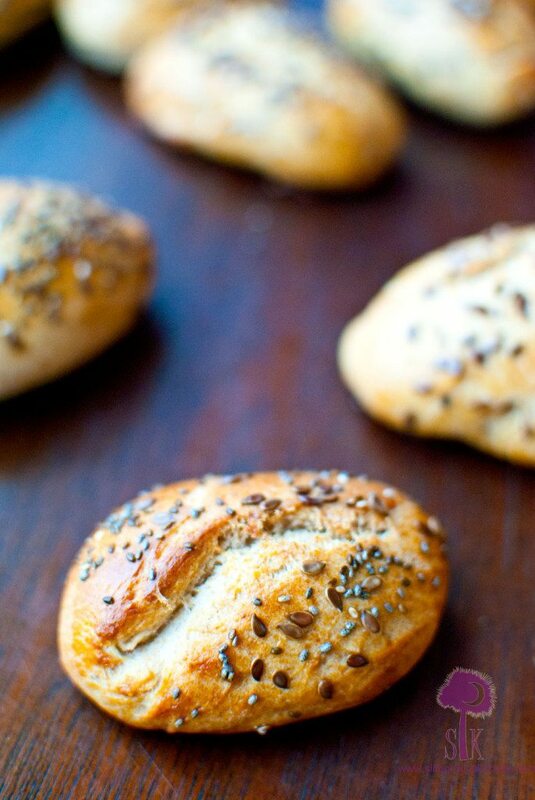 Making these amazingly easy, super simple whole wheat rolls. There are absolutely zero crazy 75 hour rising times and zero 97 hour resting times. The longest you’ll have to wait is forty minutes! 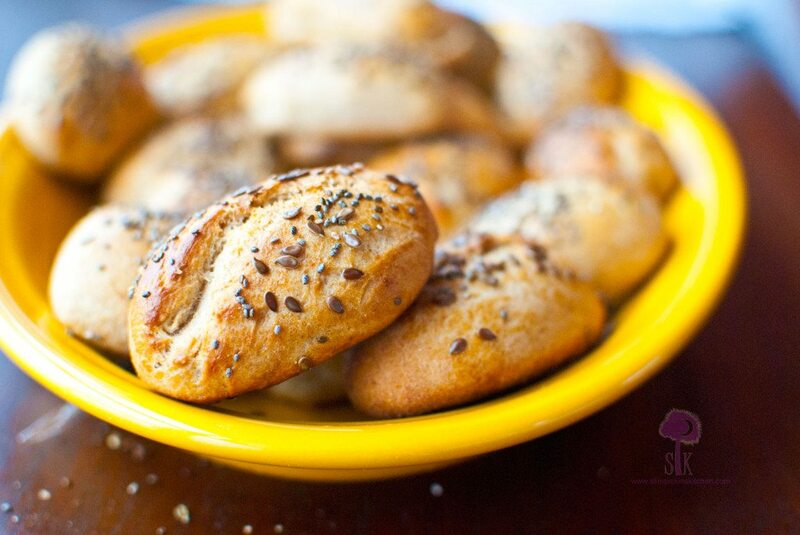 Forty minutes for fresh, made-from-scratch, warm and chewy whole wheat dinner or sandwich rolls sprinkled with chia and flax seeds and shaped to fit your needs. I made these for my Orange Bourbon Mini Chicken Phillies, but you can make them for hamburger buns, slider buns, hot dog buns, sub sandwich rolls, or even for sliced bread. With all of the crazy chemical laden whole wheat replicas on the market these days, the only excuse for not making your own bread is because you’re a bit timid to work with yeast. That’s completely understandable, and I totally get your drift but once you make these? 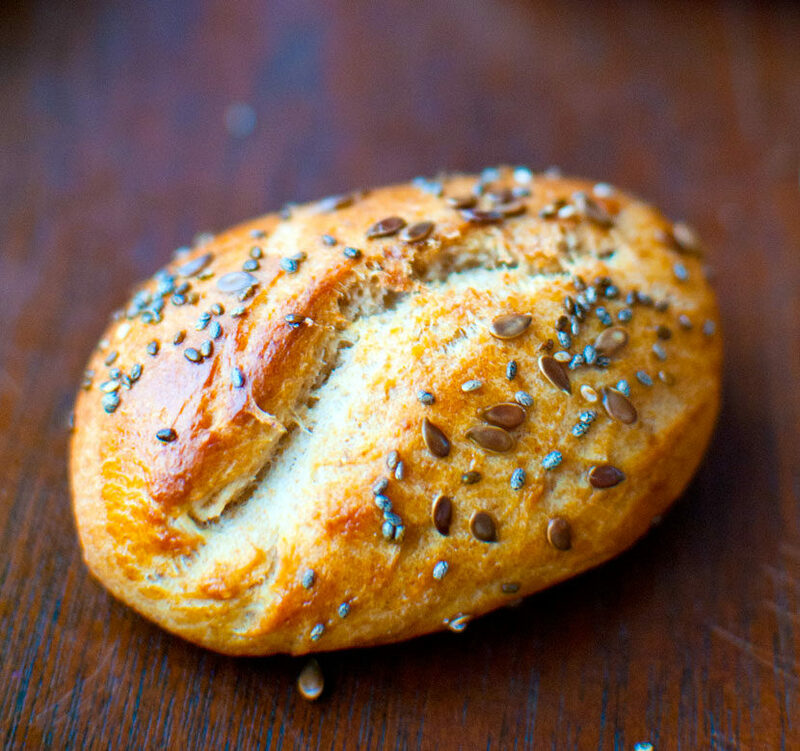 You’ll never have to worry about another scary bread recipe again. Do you know anyone due in July? Are you scared to make bread? Preheat oven to 425 degrees F. In the bowl of a stand mixer with the dough hook attached, dissolve yeast in 1 cup + 1 tablespoon warm water (the other tablespoon is for the egg wash), add oil and sugar, and let rest for 5 minutes. In a separate bowl, whisk together flours and salt until well combined. Set aside. Turn mixer to medium speed and add one egg and the flour in three increments or until a soft dough forms. Note: You may not use all of the flour! I still had about a half a cup left over. Dump the dough onto a floured surface and knead by hand until the dough is smooth and elastic, about 2-4 minutes. DO NOT LET RISE. At this point, cut and shape the dough as needed. For hamburger buns: cut into 12 pieces and roll each piece into a ball. For mini rolls: cut into 24 pieces and roll each piece into an oblong shape. Place dough pieces on cookie sheet(s) about 2-3 inches apart and cover with a dry towel. Let rest for 10 minutes. 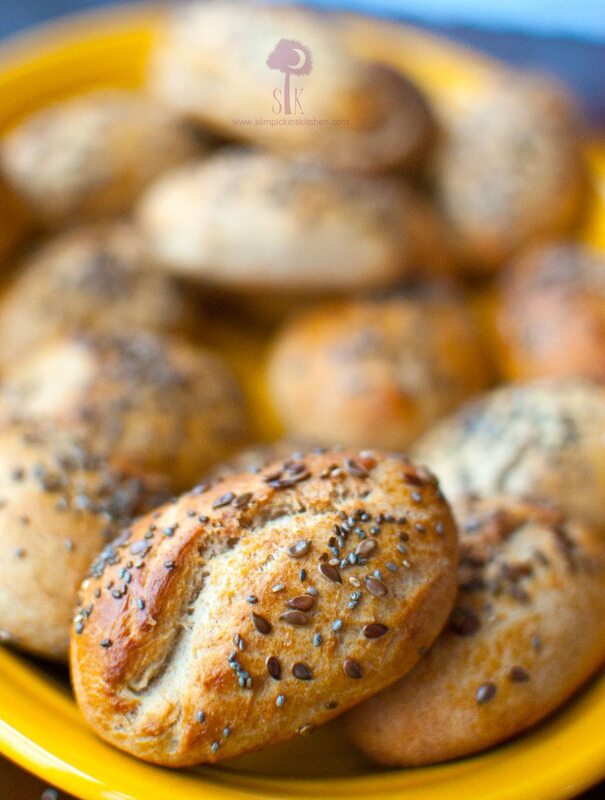 Beat egg and water together, brush over the tops of the buns, and sprinkle with chia and flax seeds. Bake for 8-12 minutes or until golden brown. Transfer to a wire rack and cool. These look so pretty! I can only imagine how great they taste right out of the oven with some butter on it.. Thanks, Natalie! They are absolutely amazeballs! So, so, so good! I clearly need to try these. Yeast and I have generally been nemesises (nemeses? ), but I made the Pioneer Woman’s cinnamon rolls on Christmas morning and it was a huge success, so now I want to make everything with yeast. I also have a large bag of flax seeds in my fridge. I do want kids. Oodles of them, by today’s standards. But first, Mama needs a RING!!! Yaaaaay for rings! Do you have any idea when he may pop the questions? WOW! 5 kids!!! That’s amazing! My husband comes from a family with 4 children, and he is adamant we won’t have more than 2. I guess we’ll see 😉 Let me know how you like the rolls! These looks delicious—40 minute rolls that aren’t prepackaged? I must try this! I made these with soup tonight. They were yummy and quick. Thank you!! 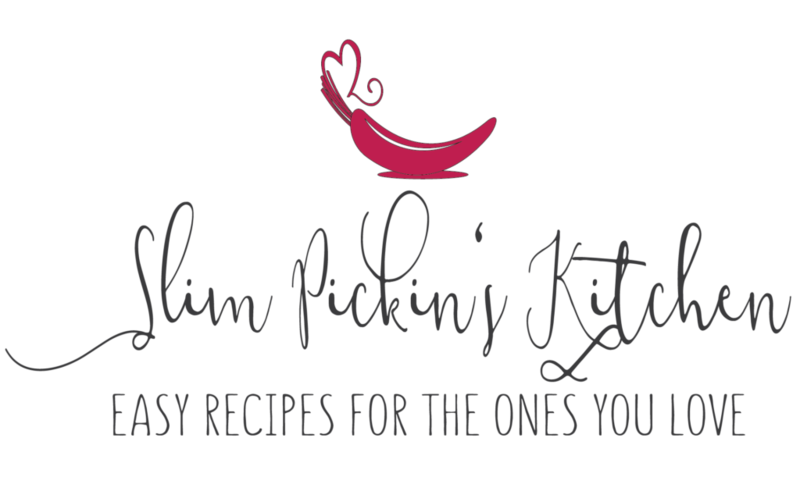 Fantastic recipe – using it tonight for french dips. Hang in there with the kid clock. It took us a while to get pregnant…and now we’ve got 3 running circles around us! These look yummy. Will be trying these pretty soon. 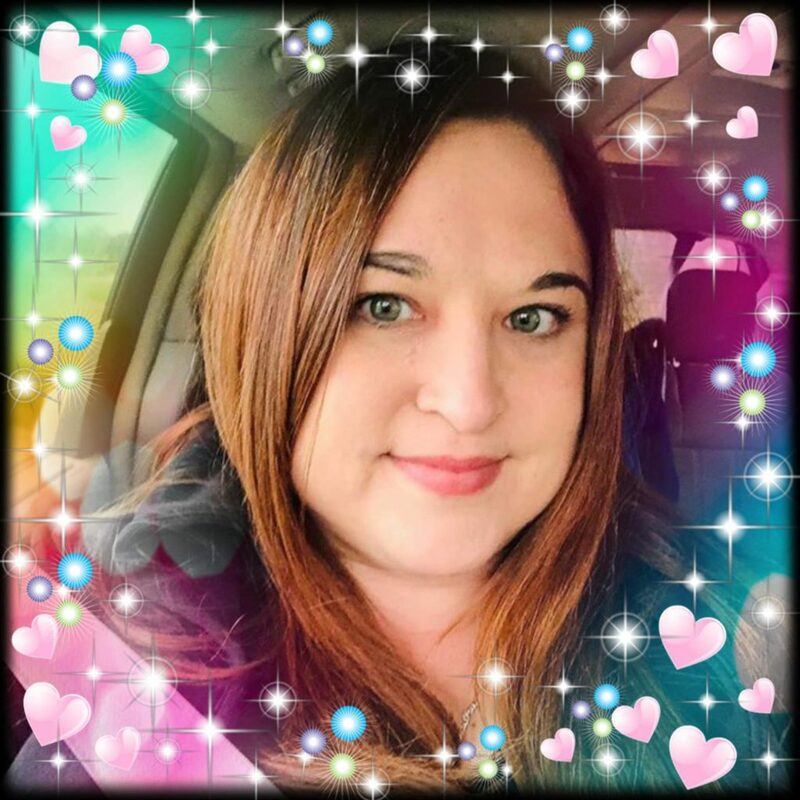 Good luck on the kiddos it took me awhile too..I have 4: a teenager and 4 yr old triplets. Keep your eye on the prize! Triplets?!? Oh my goodness, how exciting!